Our Mission...The Church of the Nativity is a living expression of the Roman Catholic Church which seeks to involve everyone in the life and mission of Jesus Christ by providing spiritual growth and faith formation for its parishioners and outreach to others. April 15 at 6:45 a.m.
April 16 at 6:45 a.m. & 8:15 a.m.
April 17 at 6:45 a.m. & 8:15 a.m. Morning Prayer at 6:45 a.m.
Stations of the Cross at 12:00 p.m.
3:00 p.m. | 7:00 p.m.
Easter Vigil | 7:00 p.m.
7:30 a.m. | 9:00 a.m. | 11:00 a.m. The Parish Office will be closed on Monday, April 22. It will reopen on Tuesday, April 23 at 8:30 a.m.
Stations of the Cross at Noon on Good Friday. Do you know a woman from our parish who walks humbly with God? As spring arrives, it is again time to nominate an exemplary servant of God who walks and works among us. Nominations are currently being accepted for the 2019 Woman of the Year. Nominate someone here. Committees are forming now to help plan Fr. Mike's 25th Ordination Anniversary Celebration in June. We need your help. Sign up here and someone will contact you. Thank you for helping! Interested in our New Nativity Day School but missed our Open House? Contact the school office at 913.338.4330 to set up a tour so you can learn more about the Day School with full-time options to meet the needs of working parents! You can for FREE. Visit www.formed.org to register. Our parish access code is: 8YCE2R. Set up your own account and password and then enjoy all the offerings! Watch a sample video here. Download our App, Church of the Nativity, Leawood, from the App Store or Google Play store. Interested In Becoming Catholic? Click here. 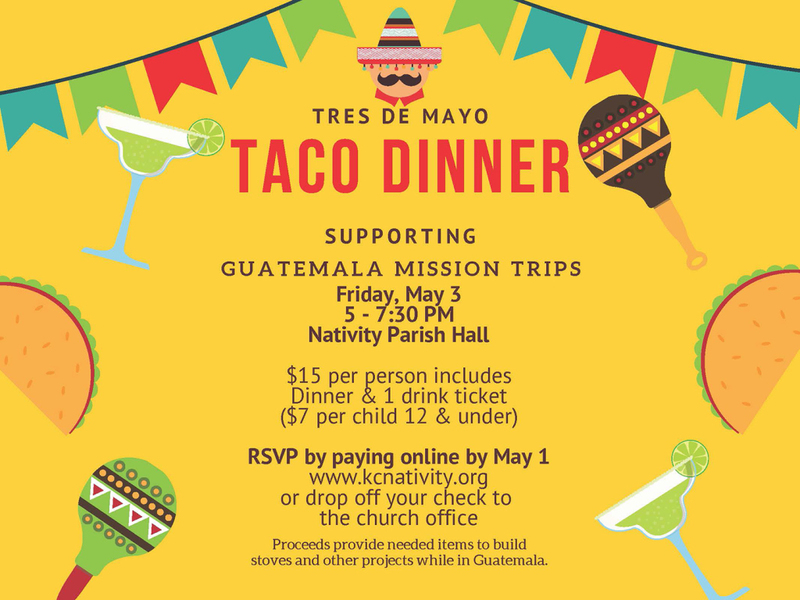 Join us on Friday, May 3 for a fundraising dinner for our Guatemala Mission Trips. $15 per person includes dinner and 1 drink. Sign up here or drop your check off in the church office. Proceeds provide needed items to build stoves and other projects while in Guatemala like Tiny Houses, Stoves, Concrete Floors, Chicken Coops and bags for Sick Calls/Visits.